Just as important as an impeccable artificial nail application or natural nail manicure is the application of the polish, which adds the finishing touch to any nail service. Every step in the polish application process, from how to dip the brush in the bottle to how to hold the client’s hand, plays a part in creating perfectly polished nails. According to Tim Farquhar, a nail technician at The Nail House in Dayton, Ohio, the most important step to ensuring perfect polish is to make sure the nail is properly prepared. “The nail surface should be clean and free of nail dust after applying artificial nails,” says Farquhar. “Also make sure there isn’t any cuticle oil left on the nail. Use polish remover to remove excess oil on natural and artificial nails.” When the client goes to scrub her nails, Farquhar dusts off his station and makes sure his hands are clean, too. Before using polish, Farquhar rolls the polish bottle between his palms to prevent air bubbles. Some manufacturers, though, say to shake the polish before using it, and Farquhar recommends following the instructions on the bottle. For the first application of polish, Farquhar places the tip of the brush at the cuticle. Using the brush, he squiggles the bead of polish by moving it up and down in the cuticle area, then brushes toward the free edge. This is her center stroke. He then repeats the same application on each side of the nail. “It usually takes me about three strokes for even coverage,” he says. On the second coat of polish, Farquhar brushes from the cuticle to the free edge, eliminating his “squiggle” technique. On natural nails, Farquhar uses a base coat as his first application of polish, and he applies it the same way as the first coat of polish. He usually doesn’t use a base coat on artificial nails unless a client requests it or if he’s using a polish that will stain the nails. Farquhar uses a top coat, though, on all types of nails to protect the polish. For Lisa Hoglan, owner of Rainbow Nails in Long Beach, Calif., every step is important in achieving picture-perfect polish. “The client’s hands should be clean, she should sit still and not fidget or talk with her hands, and she shouldn’t touch anything with the hand I am working on,” she advises. Hoglan keeps all of her polish bottles clean on the outside and also make sure the inside cap is free os polish. Before applying polish, she gently shakes the bottle 2-3 times. “When I apply the first coat of polish, I’m more concerned about getting the nail edges correct so I keep the polish thin,” she explains. When applying the second coat, Hoglan emphasizes solid, even coverage. For more control while polishing, Hoglan keeps the polish on one side of the brush only. When she applies polish, Hoglan holds her client’s fingers at a downward angle. “This way, in case there is excess polish, it won’t seep under the cuticle,” she says. Like Farquhar, Hoglan also uses about three strokes to completely polish the nail. “If three strokes doesn’t blend properly, I’ll apply a fourth stroke down the middle,” she says. Though Farquhar and Hoglan pride themselves on perfect polish application, there are times when they have to modify their technique. If too much polish gets on his brush, Farquhar swipes the brush on the inside of the polish bottle neck to wipe off the excess polish: If the polish starts running on the nail, Farquhar swipes the free edge of the nail with the brush to collect the excess polish. “If there is too much polish on the brush, it usually falls on the table before I get to the nail,” says Hoglan. If it doesn’t, she collects the excess polish with the brush, dips the brush in the neck bottle to wipe off the excess, then goes back and restrokes the nail. 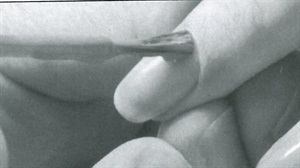 To even out the polish line at the cuticle, Farquhar takes an orange-wood stick or fine nail art brush, dips the tip in polish remover, then swipes it around the cuticle area. Hoglan uses the fine point of an orangewood stick or her fingernail to wipe off excess polish in the cuticle area. Whether you apply your client’s polish perfectly the first time around, or you have to touch-up a little, the end result is a beautiful set of polishes nails that your client can be proud of. To help achieve this, keep in mind that a clean nail surface and a client who sits still in her seat are key elements in ensuring picture-perfect polish. For his center stroke, Fraquhar uses his brush to squiggle the bead of polish by moving it up and down in the cuticle area. Farquhar repeats the same “squiggle” technique when applying polish on each side of the nail. To even out the polish line at the cuticle, Farquhar takes an orangewood stick or fine nail art brush, dips the tip in polish remover, then swipes it around the cuticle area. Picture-perfect polish has an even line around the edges of the nail, has no bubbles or nicks, and is neither too thick or too thin.